:: Rethinking prosperity is a vital task because our prevailing vision of the good life – and the economics intended to deliver it – have both come badly unstuck. Financial markets are unstable; inequality is rising; and despite the 500,000 or so people who took to the streets before Tuesday’s UN Climate Summit in New York, tackling climate change still faces a “frustrating lack of progress”. If this were not enough, the proposition that more is always better has signally failed to deliver, particularly in the affluent west. But questioning these values is deemed to be the act of lunatics, idealists and revolutionaries. This was brought home to me at the launch of the Sustainable Development Commission’s inquiry, Redefining Prosperity, which explored the relationship between economic growth and sustainability. “So this is what sustainability means,” fumed one disgruntled Treasury official. “Going back to live in caves.” This visceral response served as a foundation for my work at the commission, prompting me to frame our entire inquiry as a careful attempt to unravel the “dilemma of growth”. Beneath the dynamics of unemployment and the pervasive logic of consumerism, it was disconcerting to find an even deeper cause, a kind of existential angst about our place in the world. Politicians love this kind of rhetoric. But is it too demanding to expect something better from science? Enlightenment thinkers never intended progress to be a relentless expansion of desire. They suggested rather that society could learn to improve itself through a critical attention to the world around us and to our own place within it. We learned over time that this scrutiny could never be entirely dispassionate. But neither should it substitute dogma for careful inquiry. If you want the president of the most powerful nation in the world to sit up and tweet, you obviously shouldn’t start by stimulating deep-seated anxieties. Still, this doesn’t quite excuse the sideswipes that Better Growth, Better Climate launches in the direction of those less than convinced by the existing economic model. We learn early on, for instance that questions of growth have been “embroiled in controversy and ideological argument”; and we’re reassured that the approach of the New Climate Economy, by contrast, has been “to adopt the perspective of those who make the major economic decisions which affects people’s lives today”. In the hands of Nobel-prize-winning Paul Krugman, this thinly veiled appeal to the wisdom of the incumbency verges on outright ridicule directed at those who dare to question it. Better Growth, Better Climate “may sound too good to be true, but it isn’t”, insists the New York Times columnist. “These are serious, careful analyses.” He denounces any suggestion that decoupling growth from carbon emissions might prove difficult as “a fuzzy-headed misconception” and accuses the “left-leaning” growth sceptics of getting into bed with the extreme right climate sceptics. Krugman’s intent is clear: don’t touch growth, it’s sacrosanct. I’m reminded ultimately of Gandhi’s improbable claim: “First they ignore you, then they laugh at you, then they fight you, then you win.” It’s good to know that we’re beyond the ignoring stage. And it’s probably right to acknowledge there will be struggles ahead. That’s precisely as it should be, because there are real, complex challenges inherent in confronting the dilemma of growth – not the least of which is what to do about the visceral fear that haunts our economics and undermines our hope. But none of this should stand in the way of rethinking prosperity; and there are perfectly sound reasons for supposing that improving our prosperity is not at all synonymous with growing the economy. 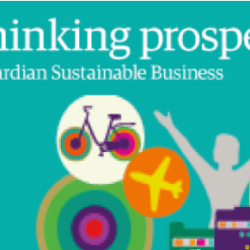 This blog first appeared on Guardian Sustainable Business – Rethinking Prosperity Hub, 22 September 2014.